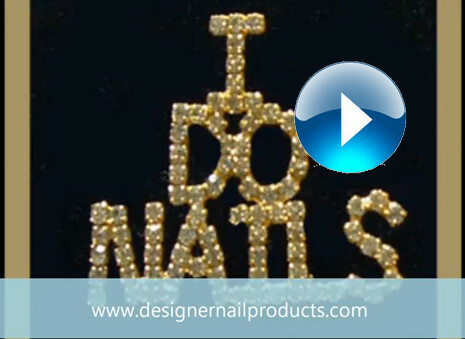 This little item makes a wonderful marketing tool for enticing your nail and nail art clients. Airbrush air gun - BEST airbrush I've ever used (says many purchasers). Tiny nozzle for airbrushing fingernails. You'll love this hassle-free airbrush gun. Try it, you'll be impressed too!! This airbrush hose easily attaches to airbrushes and air compressors. Keep your airbrush clean with this excellent airbrush cleaner! Airbrush Compressor - nails salon-ready airbrush compressor. Maintenance free. Airbrush compressors avalable in 110 volt or 220 volt electrical hookup. Airbrush connector/adapter, 2-way - connects 2 airbrush guns to 1 airbrush compressor. Airbrush at TWICE the speed when you hook up TWO airbrushes to your airbrush compressor with this dual adaptor. Cradles and securing your client's finger while airbrushing her nails. Airbrush gun cleaning tool set - includes 5 tiny cleaner brush set on a loop. This tool set helps you clean inside the color cup (or well ) of your airbrush gun. 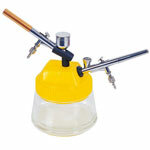 Airbrush gun holder-hanger holds 2 airbrushes comfortably. 1 step assembly onto tabletop. A "must have" item for all airbrush owners. Allows you to keep your airbrush gun clean and safe at all times. Airbrush Nails - Deluxe Airbrush Kit is the best priced airbrush kit on the internet. Deluxe Airbrush Nails Training Courses Kit. Worth every penny! Training DVD + 110v airbrush compressor + all the other items pictured here. Training DVD + airbrush compressor + all the other items pictured here. Airbrush Nails Posters for your Nail Salon. Get ANY THREE posters for the Super Saver price of ONLY $30. Each poster measures 18 x 22 inches and is printed on thick, high gloss paper. Airbrush Paints for Fingernails - Refill Sizes - White / Black (4 oz.) Priced Individually. Money saving larger bottles of white and black airbrush paint. Airbrush Paints for Fingernails in 40 Vibrant Colors. 1/2 Ounce of Paint in Each Bottle. Bargain at only $2.25 each! Airbrush Paints for Fingernails in Color Groups of EIGHT Bottles. 1/2 Ounces of Paint in Each Bottle. Choose from Paint Groups: Basic, Transparent, Pastel, Neon, & Metallic. Airbrush spray-in container prevents airbrushing messes on your tabletop and workstation. A "must have" item for all airbrush artists. Helps you to keep your work area clean and neat at all times. Airbrush Stencils for Nails -- 26 to Choose From! Use any part of the cutout, at any angle on the nail to increase versitility of your stencils. These airbrush stencils have many images, including edge cutouts for maximum usage. Airbrush Top Coat - 1/2 oz. Top coat designed for airbrushing. Won't smear or drag the design. Airbrush Top Coat - A supreme formula for sealing and protecting your airbrush masterpieces. - Refill Size - 4 oz. Refill your 1/2 oz. bottles of airbrush top coat. Magazines - Designer Nails nail art & airbrush magazines feature images of artwork in its 70 pages. PTFE Tape for eliminating air leaks. Elastic tape on a roll. Easy to store...easy to use!